Note: This article is a sidebar to this issue's feature story, "The New Water Czars." Unlike the Pima Indians of the Gila River Indian Community, the Yavapai were not traditionally farmers. 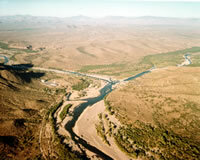 Instead, they migrated up and down the Verde River, hunting, fishing and gathering. But in 1903, the government settled them on Fort McDowell, a former U.S. Army installation used to subdue hostile bands of Apaches and tame the Arizona territory. Irrigated farms had sprung up along the river to supply the fort — which eventually led to the settlement of a quiet outpost named "Phoenix" — and for a few decades after the Yavapai took over the Army’s farms, they grew a modest couple hundred acres of wheat and alfalfa. Today, however, Phoenix is no longer a quiet backwater, and the Fort McDowell Reservation stands as an example of tribes’ rising power over — and innovative use of — the West’s precious water. When Congress approved the Central Arizona Project (CAP) in 1968, the plan called for the construction of Orme Dam at the confluence of the Salt and Verde rivers. "I propose," said Interior Secretary Stewart Udall, "to make the small but fine little reservoir we are creating here into an Indian recreation development." What Udall didn’t say was that the dam would have flooded more than half the reservation, including most of the tribal farm. The Yavapais fought the project for 10 years, and — unlike the Gila River tribes, who saw upstream dams nearly destroy their livelihood — they were successful. Today, one of the biggest celebrations for the Fort McDowell Yavapai Nation is the Orme Dam Victory Days in early November. About a decade later, the Yavapais gained another reason to celebrate. In 1990, the tribe forged a water settlement with the U.S. government that provided the Yavapai Nation with 36,000 acre-feet annually; about half of it from the Central Arizona Project, and half from the Verde River, which bisects the reservation. That’s a lot of water for a small tribe of fewer than 1,000, and the Yavapais have used it judiciously. As part of the settlement, the Yavapais got a $13 million low-interest loan from the Bureau of Reclamation (the same agency that had tried to flood the reservation 10 years previously) to expand its farm from 700 to 2,000 acres. Six years ago, the tribe planted 50,000 pecan trees and more than 30,000 citrus trees. Pecans are one of agriculture’s most profitable crops; revenue per acre can be as high as $3,500 per year. "The trees will produce for 100 years if they’re cared for properly," says farm manager Harold Payne. "They’ll provide revenue for two generations." The tribe’s farm is highly efficient. Two computerized pumping stations pull water from the Verde, inject it with fertilizer, and pipe it underground through the citrus and pecan orchards. Two micro-sprinklers spray a 16-foot diameter circle around the base of each tree. Half of the irrigation occurs at night to reduce evaporation. The farm uses about a quarter of the Yavapais’ water rights. The tribe also leases 4,300 acre-feet to Phoenix, and plans to lease more of its CAP allocation to other communities in the future. The Yavapais have also insisted that the Salt River Project, which manages the Verde River, keep enough water in the river to sustain wildlife habitat, especially for the bald eagles that nest in majestic cottonwoods along the river during the winter.